fvwm2 'themes', click on picture for full size image. Sorry, I did not include any of the root window images because I am unsure of the copyright. You should be able to find them at themes.org or the link attached to the theme. This small gzip archive contains the icon pixmaps specific for the mwm and olvwm themes, the other pixmaps came from the 3dpixmaps package. Some of these themes uses wmfortune, wmSun, wmMoonClock, bfm 0.6.4, wmweather 2.4.4, wmbiff, xload, xeyes and rclock. xload and xeyes is usually included with X Window and rclock is included with rxvt. Unless otherwise noted, these 'themes' should work fine with just about any 2.x version. Version 2.6 of fvwm2 was released, it is a very stable version of fvwm2 and has a lot of nice new options, you should consider upgrading to 2.6. I created this look after having to use GNOME3 at work (long story), I liked the basic look of GNOME3, but some customizations I would have liked to have done were unavailable in GNOME3. I tend to use this look all the time (look enhanced Mar 25, 2017). When fvwm 2.6.7 was released, it had a nice default config, after looking at it a bit I decided to create this look. There were few keywords I did not know existed, so I was able to use what I saw create this. This look, along with other required files are in this tarball and this is it's md5sums. It contains the config, some small scripts, a few xmp files along with a README describing how to set up the config. You should uncompress this under directory ~/.fvwm, it will uncompress/untar to ~/.fvwm/g3. If you notice, the buttons on the left side uses autohide, when you move the mouse pointer to the screen area, it is made visible for your use. Mouse buttons 1/2/3 will start a different application based upon which mouse button is pressed. This look uses stalonetray, wmctrl and xmessage. These are not needed but are very nice to have, xmessage is only used as part of the "Last Run" menu and you will not really notice it's absence. 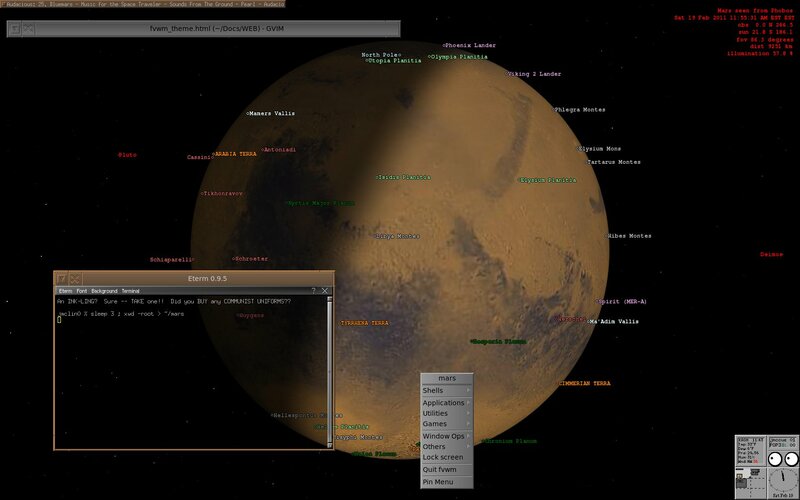 The "Last Run" menu is similar to what us used in some desktops, it lists the last 15 executed objects. I got the root image from (here) created by Plasmadesign UK, they create what I think are some cool background images. Some mini xpm files are in this tarball and this is it's md5sums. Note, before unpacking the file, you should backup your ~/.fvwm directory. 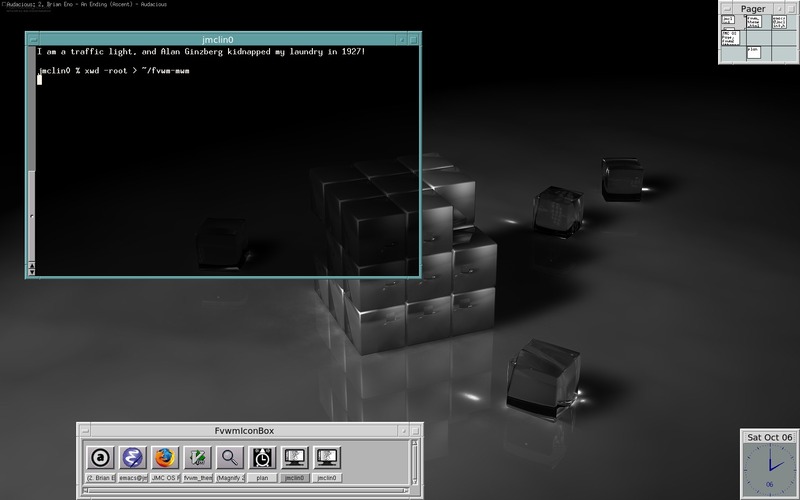 FVWM2 Config created in honor of Slackware 13.37. The root image is from slackart. 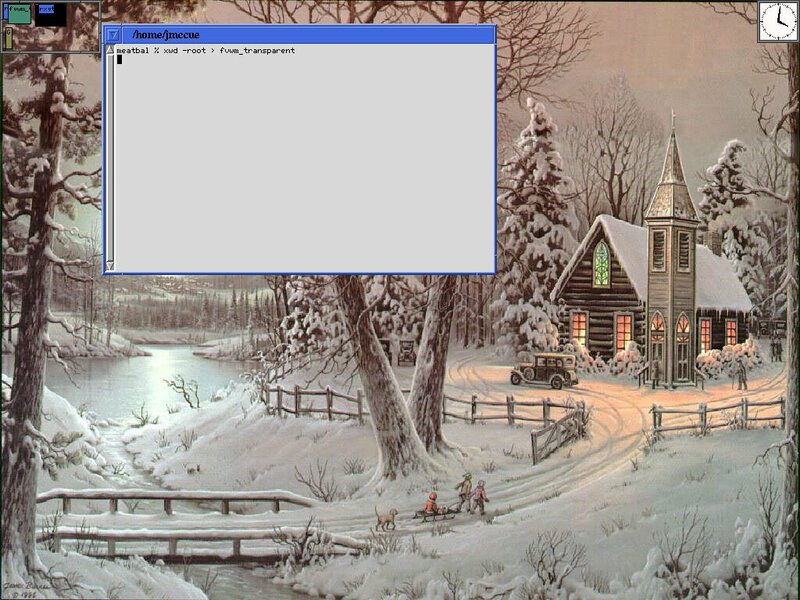 You may be able to see conky executing in a way that makes it look like it is part of the image. 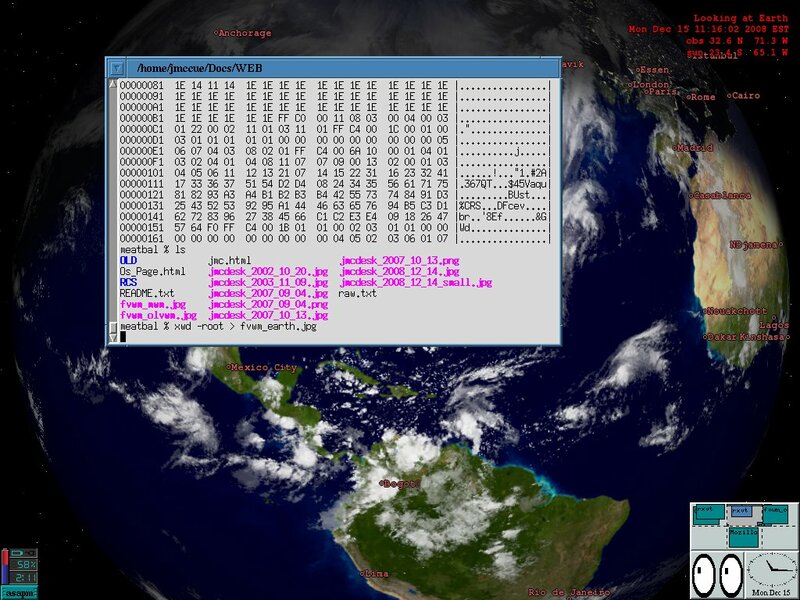 This is the config file for conky and see above for weather information. 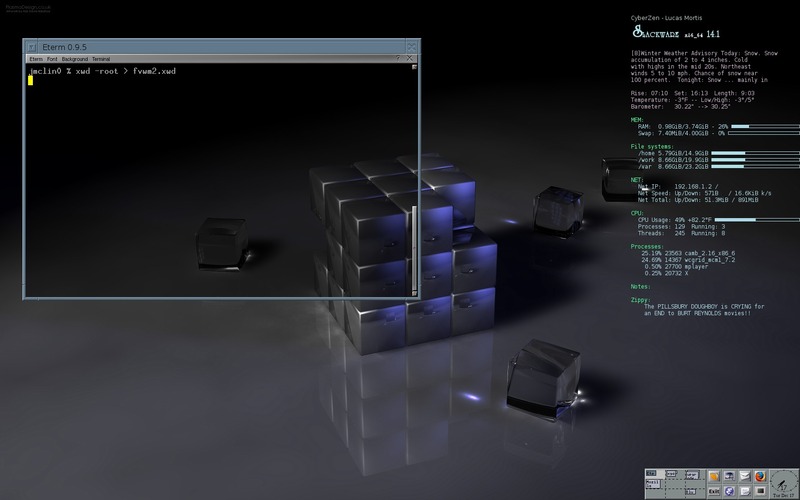 Note, conky uses the Neo Trash font, you will have to configure these files for your on use. Pixmaps for this look is here and this is it's md5sums. 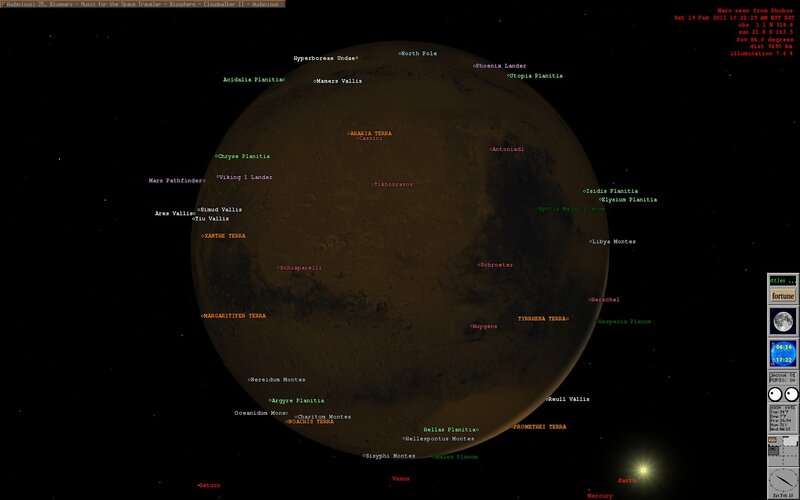 I use Phobos as the 'origin' for mars because of it's orbital speed. As you can see from here, here, here and you get some interesting root windows. 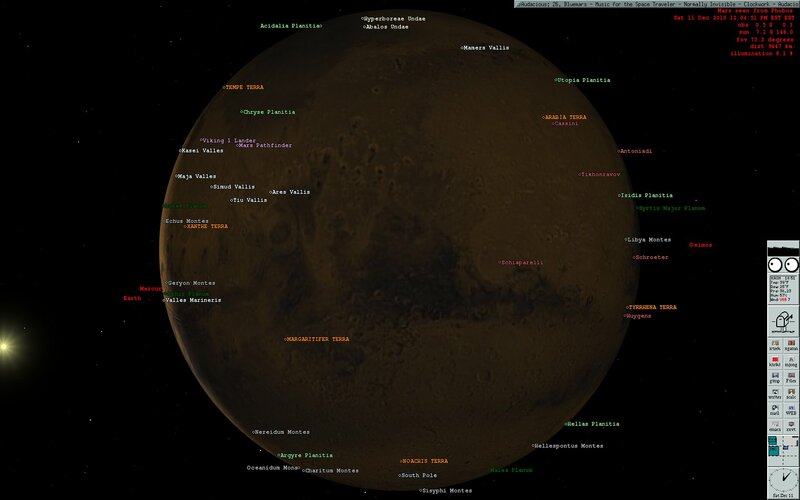 I got the map files from JPL and this, this and this are my marker files. These are prints of the original looks, old earth and old mars. 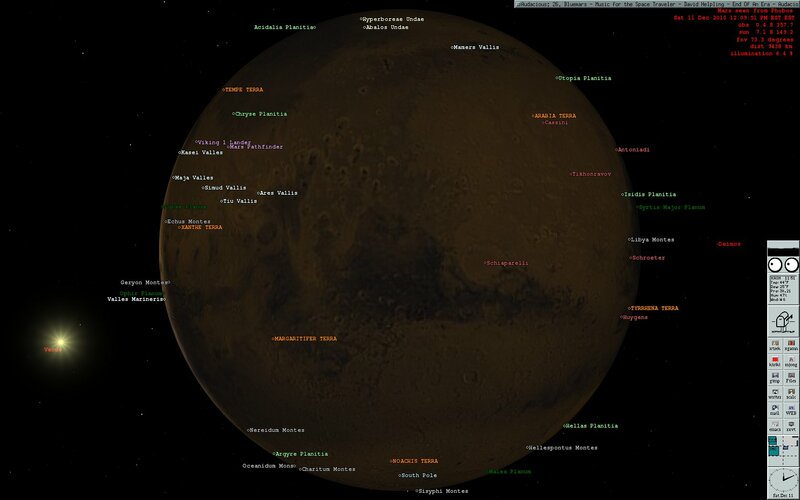 The new versions use colors that try and match the planet shown. FVWM2 Config A look built around the root image and a somewhat simple conky file. The root image is from a blackbox theme called 'null' on themes.org, but looks like all the themes were removed. The null theme was created by cthulhain, who knows, maybe it is still there. All the conkyrc does is cat output files created by some cron jobs, this allows me to avoid having a complex conkyrc file. See above for notes on weather information. One of the scripts I created formats various log files in /var/log and puts the output in my home directory, this job needs to be executed by root. Another script writes the days events to a file. Those scripts are quite customized, but should be easy enough to create. The clock is dclock. Config. 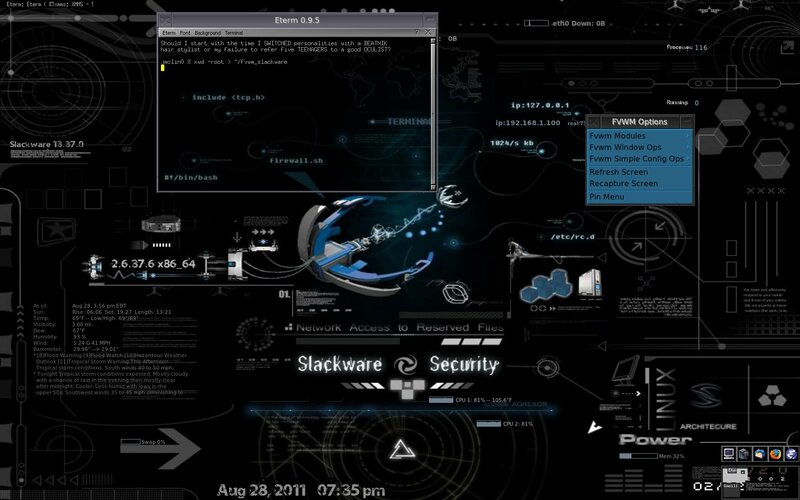 A basic look I use once in a while, when I want a 'fancy' root window, I usually start up xplanet or conky. This Config File requires version 2.6+, it accomplishes what I was trying to do with the vtwm themes I created years ago. 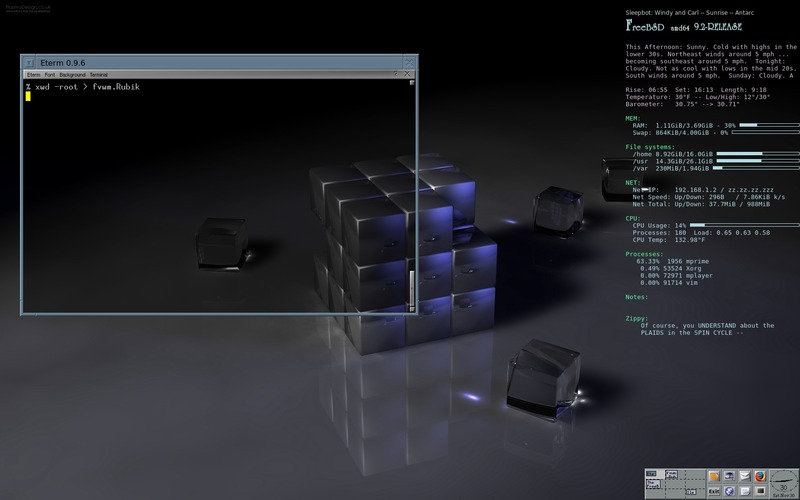 Mainly I wanted a transparent panner (desktop), which was done in vtwm using nexpm. fvwm now has the ability to do that in an easier fashion. Root image from themes.org. From here below are themes built from other people's configs or inspired by other Window Managers. 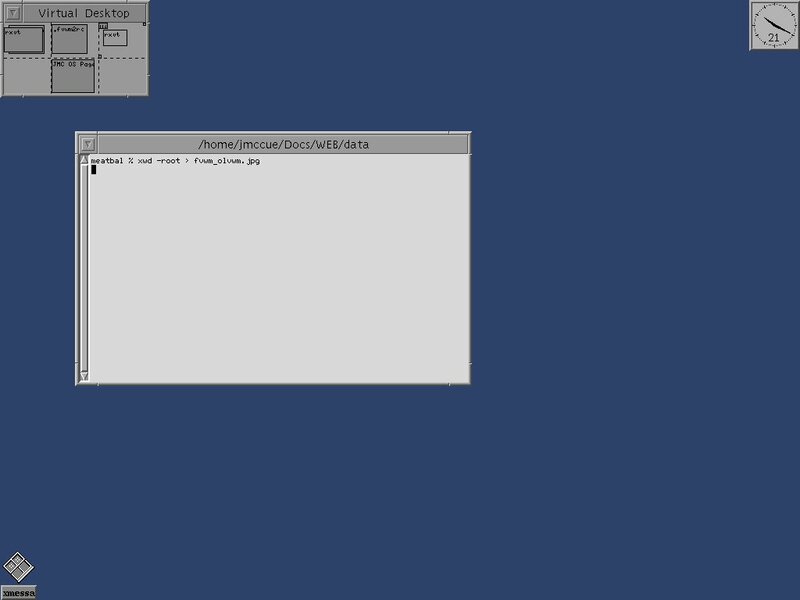 This is a much better clone my old mwm look, it uses FvwmIconBox to better emulate mwm. I created it after playing around with openmotif, I liked the mwm that was included with it and quickly realized I could get fvwm2 to closely resemble it and use the advanced features of fvwm2. All files needed are in this tarball and this is it's md5sums. Note, before unpacking the file, you should backup your ~/.fvwm directory. CDE, kind of look-a-like. 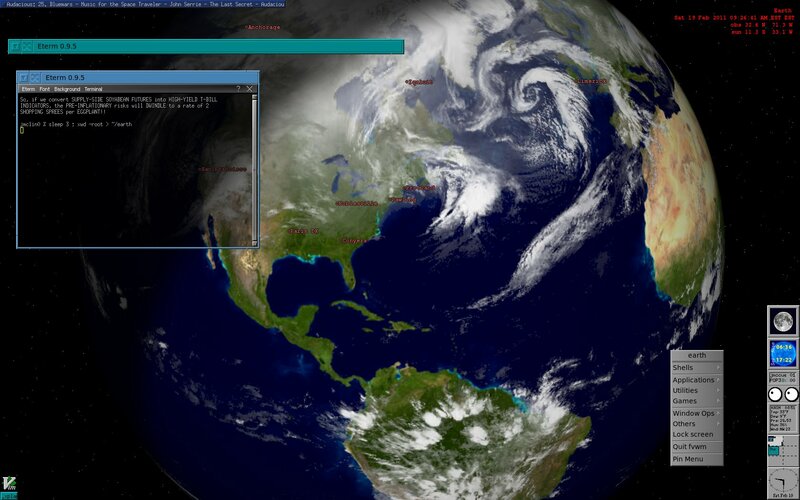 This config is as close as I got using basic fvwm options, meets my needs :) This tar file (md5sums) contains the pixmaps specific to this look, all others came from 3dpixmaps. Update, changed the config to use 'Actions' in FvwmButtons. With that change I find I am using this fvwm configuration a lot. Afterstep, Version 2.x look-a-like, Config File. Afterstep has a cool look, created this to see how close I could come. I came up with this by examining Decors on this Dorothy's, site. You will need to use version 2.6+ of fvwm2 for this to come out right. Note, see new version above. mwm theme Config File, this was quite trivial to create, I created it so I could have the look of two of the main UNIX WMs of the early 90s, Open Look and mwm. Root Image from themes.org. Config. Clone of ctwm gfive theme. Always liked the unique look, dclock is executing in the lower left corner. Config. Clone of ctwm jens theme. Another cool look I converted for use in fvwm2. The root image is from xphoon and this File (md5sum 842493f194bbc224bbd7c98960f48466) contains the xpms for FvwmButtons. Config. 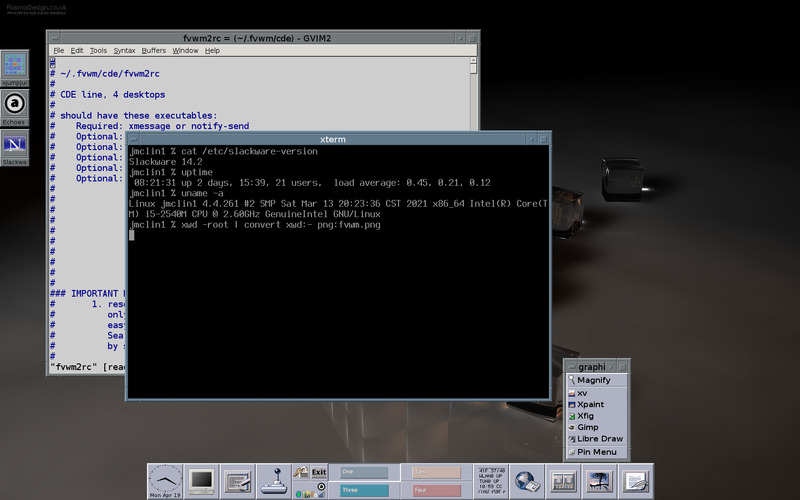 Clone of fvwm 1.x geir theme. Converted this very nice look (with some changes) for use under fvwm2. Config. 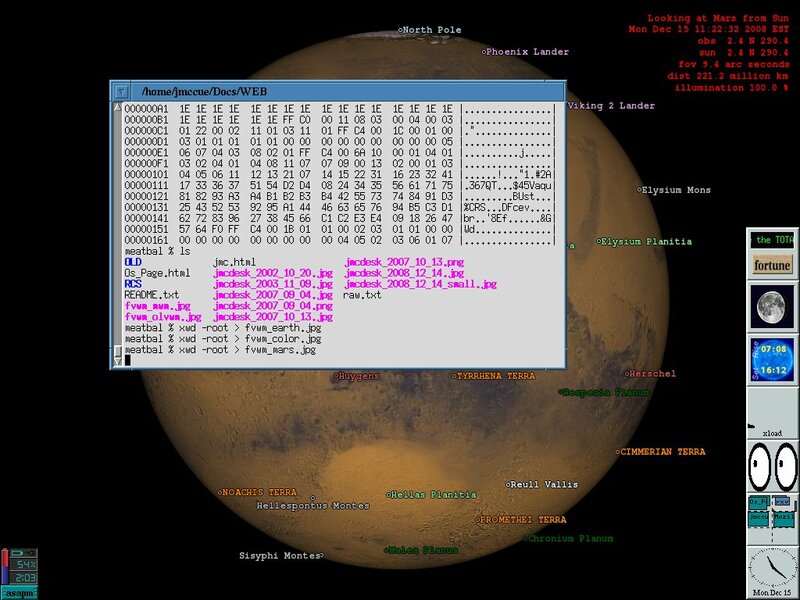 An fvwm2 theme from Prof. Knuth. It has a simple look which I think is kind of nice, I made minor changes to the config, but the original is here. Number xpm for this look is here and this is it's md5sums.